Keep your books safe and secure with the products in our Bookends Category here at Superheroes Direct. Our highly detailed bookend statues protect and uphold your reading material, as well as look excellent on any shelf, desk, or mantle. Featuring beloved characters from favorite superhero comics and movies, our bookends make great gifts for the comic enthusiast in your life, perfect for keeping their collection of comics neatly displayed with superhero style. Created from high quality materials like cold cast resin and painted with detail, add these collectible bookends to your shelves today. Keep checking back at this section for updates to our Bookend Category. Daenerys Targaryen is given three petrified dragon eggs as a gift for her wedding to Khal Drogo. 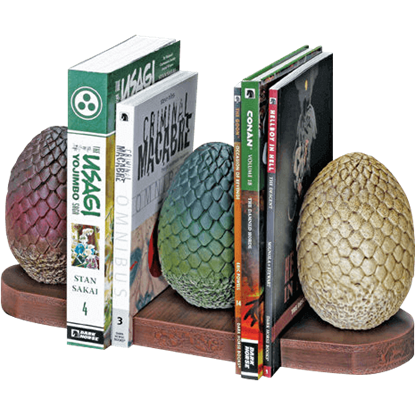 The Game of Thrones Dragon Egg Bookends cleverly replicate all three eggs as a deluxe set of triple bookends for putting on display.